8 mm film, 8 track tapes, 8 inch floppy disks, all once promising media storage formats are for the most part gone from our daily use and even popular memory. Replaced by modern day equivalents of WAV files, MP3s, and cloud computing, our common media storage and delivery has moved from the tangible to intangible. 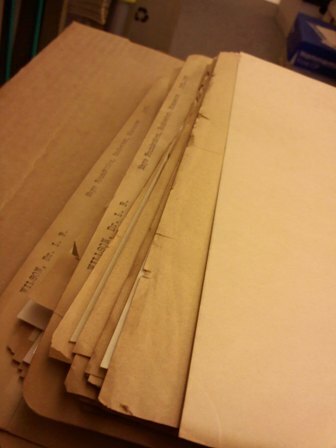 What is an archivist to do? The time has come where archives and libraries are better equipped and staffed to manage the latter rather than the former. Maintaining AV rooms filled with half-working equipment for playback is a no win situation. Institutional repositories and internet based applications are better able to store, playback and preserve digitally created information than ever before. A recent discovery of a box full of 8 inch floppies all marked as correspondence from the office of the Vice President for Health Sciences demonstrates the conundrum in the collection of historical documents. On the one hand, the content of the disks are absolutely central to the collecting focus for the History Project, yet on the other, the media is so obsolete and likely degraded to the point of being unable to retrieve any information. 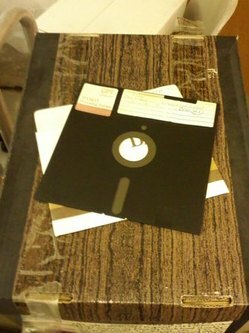 The 8 inch floppy, like its successors the 5 in., 3.5in., Jaz and Zip disks, were tied to specific hardware operating systems. Yet, it often had multiple formats, disk densities, transfer rates, and spinning heads that made them even in their prime incompatible with other 8 inch disk drives. The ability to rescue data off any 8 inch diskette today would be beyond most IT skill sets and, due to the low data capacity they actually held, not worth the expense. 1980s computing taught us in the 1990s to fear the question of “how will I be able to save, read, open, edit this after the media, format, software, hardware changes?” However, in the last ten years the migration of electronic records has become easier to understand and to accomplish with only minor cautionary steps. Changes in storage media will always challenge our preservation techniques and cause a few gaps in recorded history. This is to be expected and for the most part accepted as progress to better record keeping. I’m sure the first few recipes for baked clay tablets didn’t quite turn out as expected, yet I’ve never heard anyone mention cuneiform tablets as an unstable media. So with this in mind I will look at my box of 8 inch floppies, and the information they might contain, and realize that this gap of documentation is an example of the jumps made from one media system to the next that is likely lost to history.